North Korea is on "an aggressive schedule to build and deploy its first operational ballistic missile submarine", according to an analysis of new satellite images by the expert website 38 North. It already has a prototype sub and a submersible launching barge, from which it has carried out a number of test firings. But the new images show that significant work is under way at the Sinpo shipyard on North Korea's eastern coast to expand its construction facilities, and there are hints that another missile-carrying submarine may be under construction. N Korea: Where is the war of words heading? The imagery shows two large circular objects that could be sections of a submarine's pressure hull. 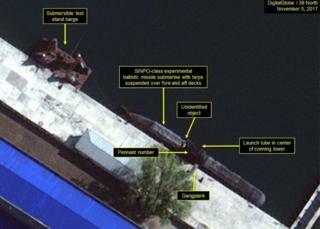 Size estimates suggest the objects could be for a follow on vessel to the existing prototype SINPO-class boat. Satellite images show a continued movement throughout 2017 of parts and components into and out of yards adjacent to the shipyard's large construction halls. Gantry and tower cranes have been regularly moved, all suggesting a "prolonged and active ship-building programme", according to 38 North. Work has also been under way at a missile test stand that is apparently used to replicate the ejection of a missile from a submarine's hull. From satellite images alone it is difficult to assess how much progress North Korea's submarine-launched missile programme has made. But Mark Fitzpatrick, a veteran arms control expert with the International Institute for Strategic Studies, told the BBC that submarine-launched missiles would give North Korea a second-strike capability if it faced an attack intended to take out its nuclear forces. Mr Fitzpatrick also noted that "up to now, North Korea has frequently surprised analysts and exceeded expectations in terms of the pace of its missile development". But the programme is a measure of Pyongyang's strategic ambitions, and another indication that it is unlikely to give up its nuclear arsenal any time soon. Video What does Asia want?